Born in Brooklyn, New York, on July 19, 1953, Howard Schultz is an American Business and CEO of Starbucks from 1986–2000 and again from 2008–2017 and executive chairman from 2017 to 2018. In 2016 with the net worth of $3.1 billion Howard Schultz ranked 232nd richest person in America according to Forbes magazine. Howard Schultz was born in a Jewish family living in Brooklyn, New York. His mother name is Elaine and his father name is Fred Schultz who is ex-US Army trooper and then a truck driver. He grew up in the Canarsie Bayview Houses of the New York City Housing Authority with younger brother Micheal and sister Ronnie. As his family was poor, young Schultz saw an escape in sports.Schultz was a natural athlete he loves playing basketball and football during his school days. He was awarded an athletic scholarship to Northern Michigan University, that time he was the first person in his family to go to college. After graduating from the university with a Bachelor of Science degree in communication in 1975, Howard Schultz started working as a salesman for Xerox Corporation and later promoted to a full sales representative. In 1979 he changes his job and joins Swedish coffee maker manufacturer Hammarplast as a general manager responsible for their United State operations with a staff of twenty. In 1981, during his visit to Seattle, Schultz visited a client a fledgeling coffee bean shop called Starbucks Coffee Company. He was very impressed with the company’s knowledge of coffee and expresses his interest to work with them in near future. Just a year later, Schultz joined Starbucks as director of retail operations and marketing. Interestingly at the time, Starbucks only sold coffee beans, not coffee drinks. After joining Starbucks Schultz in 1983 went on a buying trip to Milan, Italy where he noted that coffee bars existed on almost every street. What he like that they not only served excellent espresso but they also served as meeting place for peoples and these cafes were an important part of Italian culture and society. While in Milan an idea occurred to him that Starbucks should start selling coffee drinks not just coffee beans. Schultz recalled during one of his interview at that time he thinks that he saw the future and can’t wait to get back to Seattle to discuss this with the founders of Starbucks. Schultz’s enthusiasm for opening the coffee shops in Starbucks stores wasn’t shared by the company’s founders. He tried to persuade the owners until finally, the owners let him establish a coffee bar in their new store which was opening in Seattle. New Starbucks store was an instant success, bringing in hundreds of people per day but the Starbucks owners refused to roll it out company-wide.Company founders didn’t want to go in the direction Schultz wanted to take them and are not interested in the restaurant business. Frustrated and disappointed Schultz decided to leave Starbucks in 1985 to open a coffee bar chain of his own, Il Giornale. Schultz new venture Il Giornale quickly garnered success as the store offered ice cream in addition to coffee and played opera music in the background. Within 2 years with the help of investors, Schultz purchased Starbucks for US$3.8 million and merges it with Il Giornale. After becoming CEO and chairman of Starbucks Coffee Company Schultz aggressively expanded its reach across the US and grow the company rapidly. Schultz did not believe in franchising model and that why made a point of having Starbucks retain ownership of every domestic outlet. 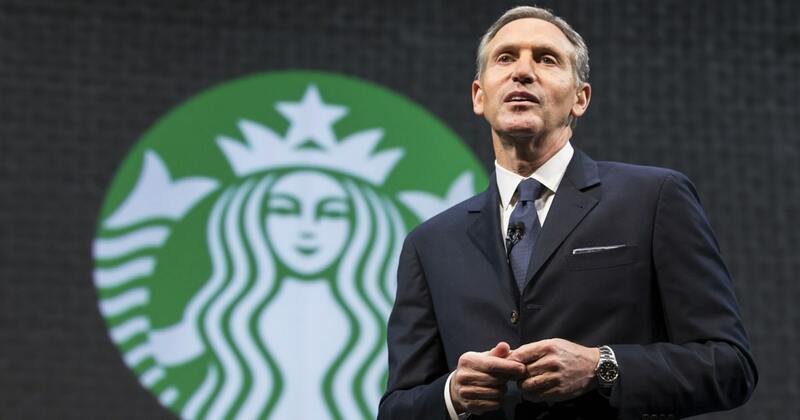 In 2000, Schultz announced that he was resigning as Starbucks’ CEO and move to the new position of chief global strategist to help the company expand internationally. However, 8 years later in January 2008, Schultz returned as CEO of Starbucks. Today, no company in the World sells more coffee drinks than Starbucks. The popular coffee company reportedly opens two or three new stores every day and attracts around 60 million customers per week. By 2018, Starbucks had grown to more than 28,000 stores in 77 countries around the world, and its market capitalization was valued at $79.14 billion. In June 2018, Howard Schultz announced that he would be stepping down as chairman of Starbucks. This move added fuel to the rumour that he was considering a run for United States presidential election in 2020, and Schultz did little to diffuse the speculation. Howard Schultz currently lives in Seattle, Washington, with his wife, Sheri and two children Jordan and Addison.